Got some potatoes lying about...? Make some wedges! One thing I love about potatoes is just how versatile they are! I bought this bag because I’d been craving potatoes after watching an anime series where they served steamed potatoes with butter and something about it looked so good LOL. I think there are well over 20 recipes I can think of when it comes to potato dishes and I’m sure the list doesn’t just end there. With this recipe, the only prep was to cut the potatoes into wedges, which, to be honest is no prep at all. 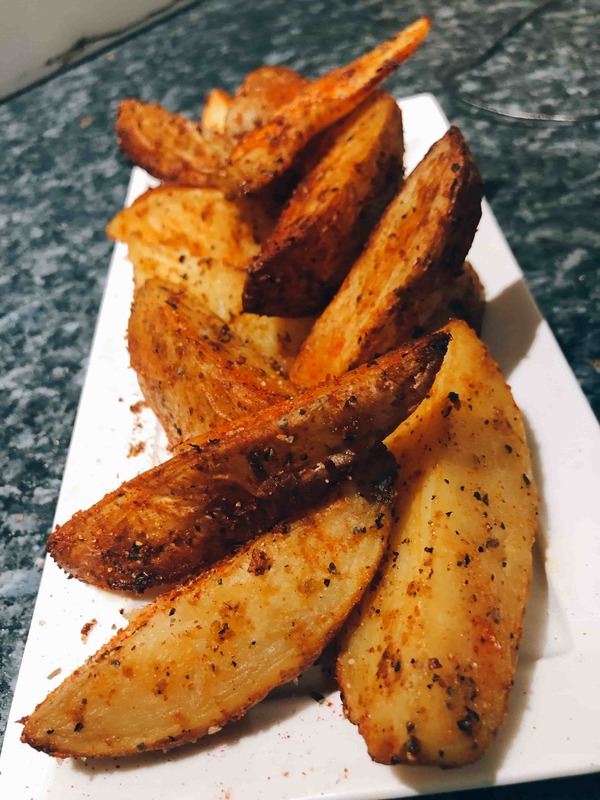 For the recipe, I wouldn’t even call it a recipe but I know people tend to go out and buy pre-made/frozen potato wedges when they taste so much better at home. Just toss them in your favourite spices and herbs and voila! These are the herbs and spices I chose to use but go wild or you could even go simple with salt, pepper and rosemary! Definitely try these out with sweet potatoes too. Sweet potatoes may need a little cornstarch included in the mix for crispness and I’d skip out on the oil and go for oil spray as they have more of a tendecy to go soggy. Anyway without further or due, here’s what you’ll need! Mix the spice blend in a seperate bowl and sprinkle over the oiled wedges. Place the wedges on a lined tray and bake in the over for 30-40 minutes or until cooked through and golden brown. Turn them half way through cooking for even browning. Serve with your favourite dip or enjoy as a side!